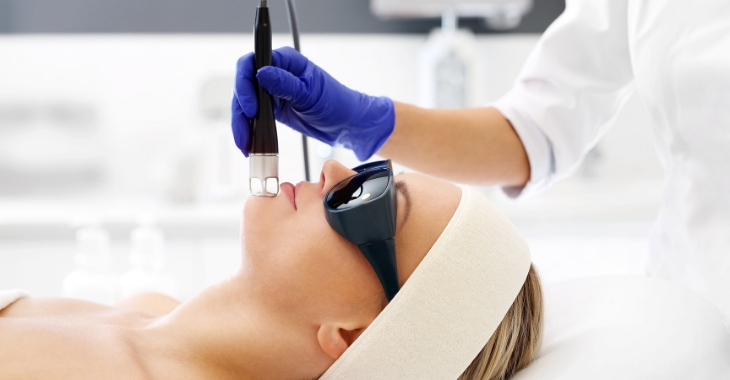 Laser therapy for aesthetic enhancements have come a long way, offering various applications to improve your appearance. This non-invasive procedure can produce dramatic results in a quick visit to a med spa or plastic surgery clinic, without the pain or excessive downtime that is required for some cosmetic treatments. Here are five different ways laser therapy can help you look your best from head to toe. Hair removal. Most people have heard of laser hair removal, but yet still have not explored this amazing solution. Laser treatments can permanently remove hair from legs, arm pits, backs and other areas – no more shaving or waxing required! Wrinkles and lines. Laser therapy can help restore the youthfulness of skin, reducing the appearance of some wrinkles and lines that appear on the face, neck or chest area. Sun damage. Sun spots and unwanted freckles can appear due to sun damage to the skin. Laser treatments can fade or remove many discolorations on sun-damaged skin. Varicose or spider veins. Do you hide your legs due to spider or varicose veins? Laser treatments are a wonderful way to dispel these blue webs on your legs, so you can confidently wear shorts or skirts again. Acne treatment and scars. If you have or had acne, consider laser therapy. It is effective way to treat existing acne and can reduce the appearance of acne scarring. Different lasers are needed for various treatments – you want an experienced medical professional that has the right equipment and expertise for the laser therapy you desire. Contact a plastic surgeon that offers laser therapy to get the safest and best results for your cosmetic procedure.